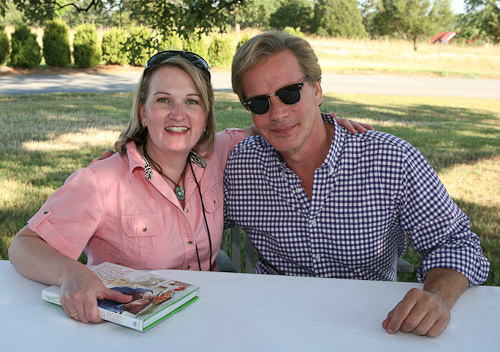 That time I hung out with P. Allen Smith for the day. Oh, and a dozen other bloggers. But I think he liked me best. If you follow me on Twitter or on Facebook, you may know that I recently had the privilege of touring P. Allen Smith’s amazing garden home in Roland. Can you say, amazing? Inspirational? I totally want a vegetable garden and my own heritage breed chickens now. The event, called Bean 2 Blog, focused on soybeans and was a chance for the Arkansas Soybean Promotion Board to chat up their wares to just shy of a dozen of us blogger types. I honestly expected to have to put on my PR shield, which is pretty savvy, having been in the field myself. (Haaa, see what I did there?) But the event was very tastefully done, and I learned a lot of useful information about the magic bean. Mulberry, Arkansas, will be the site of the U.S.’ first soybean crop developed and grown specifically for use as edamame. It’s a particular variety of soybean that makes the best edamame, and the growing, harvesting and storing practices are different than usual soybean production. The new crop will bring several hundred new jobs to the area. You can totally make your own soy milk. I always knew this, but seeing it done in person got me all kinds of excited. My son and I are allergic to cow’s milk, so we go though quite a bit of those red boxes of soy milk. (He calls it “red milk.”) And it only takes about a cup of soaked dry beans to make a quart of milk. Given, I’ll probably have to add a bit of honey and calcium carbonate to reach “red milk” standards, but it would be worth it. Arkansas does indeed grow non-GMO soy, but not much; only about 2 percent of the current crop fits this description. Much of this goes overseas to Asian countries, and the rest goes to companies like Silk to make soy milk and other products. Speaking of GMOs, the jury is still out within the industry, and they’re leaning heavily toward modification. While many of us foodies rail against them and demand non-GMOs at reasonable prices, this is simply not currently feasible for your average Arkansas farmer. GMO varieties have greater yield and generallyuse less herbicide, despite the “super bugs” that are coming about. Farmer margins are slim as it is, and until something changes (like a tremendous rise in demand), non-GMO crops generally aren’t profitable enough.My personal take on the solution: Continue asking for it, folks. The industry knows we’re out there. But be nice; the farmers have to make money, too. Soybeans are used for all kinds of non-food products, such as paint, ink, machine lubrication, wax (for things like candles and lip balm), even a high-efficiency sprayed foam insulation for homes. It’s renewable and just downright groovy for the Arkansas economy. I usually don’t write a bullet-point list like this, but I learned so much during this event that it’s hard to cover any one thing thoroughly. However, I’ll continue soon with more details on soy recipes and other topics, as well as a separate post about P. Allen Smith’s digs. Did I mention that I’m totally going to buy a soy milk machine? P.S. With a gaggle of girly bloggers, this event was as much fashion as it was farm, partially to my chagrin. I’m just not girly enough to care, most days. 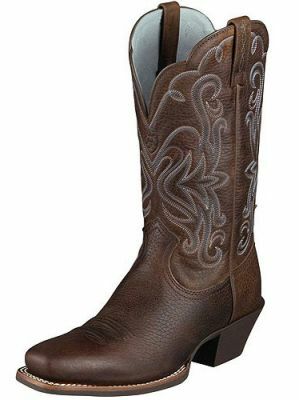 But, thanks to Country Outfitters, I at least had some super-nifty Ariat western boots to wear, like the other girls. My first ones, ever! Disclosure: They were a gift. Additional disclosure: I LOVE them. Comfy after an entire day of tromping the grounds. Love your post about the Bean2Blog day! I enjoyed the day very much too, and I'm so glad to have met you! I'm jealous!! :) I love P. Allen Smith, I think has done some great things on so many fronts. Looking forward to more posts on your day! Esp on growing soybeans and making soy milk.